My great-grandfather, Alfred E. Cannon, is sitting on the ground third from the right in this photo. He enlisted in the East Surrey’s Regiment on 7th August 1915 and was discharged on the 20th November 1918 as unfit to fight. My Grandmother remembers visiting him in Brighton whilst he was recovering “…from being gassed on the Somme”. Can anyone shed any light on where and when this photo may have been taken? Are there any records referring to wounded troops convalescing in Brighton? Also, would it be possible to find out where and when the East Surrey’s may have been gassed on the Somme? I would be very grateful for any information, or suggestions as to where I can proceed with my search. 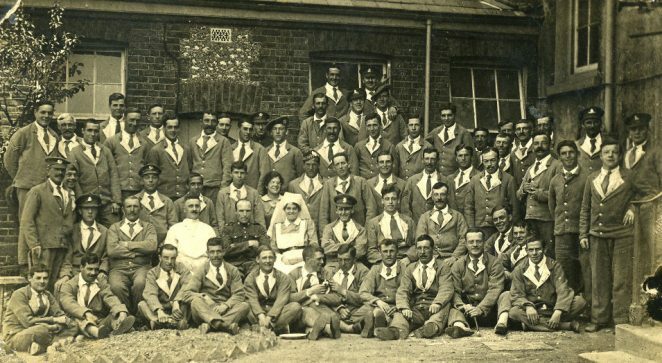 Hi David, Try the Chailey Hospital web site for 1914-1916. There was a guy there from the East Surrey Regiment, also photos. I don’t know if the clothes your grandfather is wearing is uniform, there is a photo of men wearing the same. Hope this helps. I think it might be Bevendean Hospital, better known by its other name ‘The Sanni’. Hi David, A very interesting photo and subject. I had a great uncle who served in the 8th Battalion East Surrey Regiment on the Somme in 1916. He unfortunately died of wounds in November 1916 in France incurred whilst engaged in ‘the final Battle of the Somme’. This was, however, before the Germans’ big push in 1918 where they retook the area and the East Surrey Regiment were involved, I believe, in taking it back again. When I was trying to trace what my great uncle was involved in, I found a web site called ‘The Great War Forum’. Here are many very well informed and incredibly helpful people who will most certainly have the answers to your questions – and it is free! I ended up with copies of extracts of war diaries and trench maps to the extent that we are travelling to France in 2008 to see the exact area of the battlefield pinpointed by the info supplied. There is also an East Surrey Regimental Museum in the Farnham area. I hope that this helps and that you can give a follow up to this with any info/results that you get. As a PS to this my grandfather (his brother) was gassed whilst serving with the Rifle Brigade and was discharged from the army and put in a hospital in Hove sufferring from the effects of mustard gas (including blindness). As his injuries were thought to be only temporary he was discharged ‘A1’. He died in his 50s with lung problems. All the best. My great grand father was from Tooting. He was a Royal Engineer. I also have a similar photo, although it is less formal and only involves 10 men. He lost an arm during World War 1. In the picture I have circa 1916 he had only lost two fingers. He was sent back to the war zone however and later lost the arm. He died in 1943 aged 52. I too would like to know where my photo was taken. I will try to put the picture on the internet for people to view. The picture has the words 206 European War series Wounded Soldiers In Hospital At Hove on it. This photo is interesting as I am fairly sure my Uncle is in the second row. He was in the fuselliers and was gassed in 1916. If so, then this picture is taken at Shoreham where he was sent for rehab (somewhere near where the rope tackle is today). It was a collection of buildings and medical treatment was given. He had a bayonet wound to his hand. My grandfather, Frederick Richard Hall served in the First World War, enlisting from his home address in Walworth, South London, then part of Surrey. I have been unable to ascertain the regiment he served in. His wife moved to Brighton when he was convalesced out of the army to be close enough to visit him. We had a picture of him wearing this uniform (which was supposedly blue, my mother tells me was known as hospital blues). The family moved to Toronto Terrace, Southover Street. I’d like to know if anyone has information on the buildings that were used as convalescent homes that would have been accessible from Southover Street. The family never moved back to London but stayed living in Southover street until the 1960s when my Grandmother died. They raised their children there, some born in Southover Street as were some of their grandchildren.